On cold days, one of my favorite cozy lunches is grilled cheese and tomato soup. It warms me down to the bone….along with a fabulous pair of wool socks. Grrrrr. 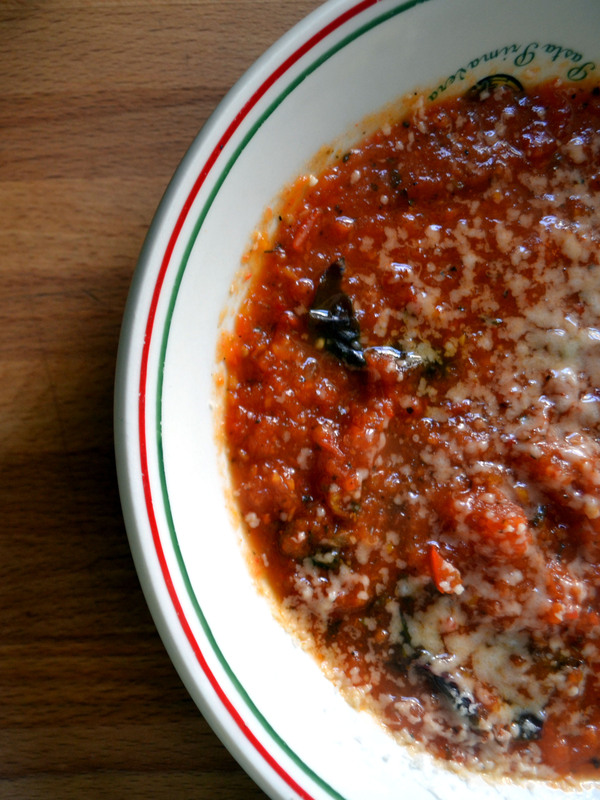 Now seriously, who doesn’t love a great tomato soup. Canned varieties of tomato soup don’t hold a candle to freshly made creamy tomato soup. I bought 10 lbs of bruised tomatoes, also known as seconds, at the farmers market. I got them at a fraction of the price…$1/lb instead of the $3/lb. These are great for canning, roasting, or cooking down into sauces. However, you have to either can these suckers quickly or cook them. If you let them sit around, you will have an entire family of fruit flies moving into your kitchen. So with all these tomatoes and the cool fall weather setting in, a huge batch of tomato soup seemed appropriate. This is a great recipe if you have a bumper crop of tomatoes. Buuuuut, if you are like the rest of us and had a depressing tomato season then either buy seconds or you can use a large can of crushed tomatoes. Although I really love this soup, next time I will roast the tomatoes for 1 hr at 400 F before putting them in the soup to add a deeper flavor. I add a carrot and red bell pepper for extra veggie oomf, but you can leave these out for a pure tomato basil soup. Heat olive oil in dutch oven over medium-high heat. Add onions and cook for 5 minutes, until onions are translucent. Add minced garlic, carrots, bell pepper and cook for another 5 minutes, or until carrots begin to soften. Add diced tomatoes, honey, and broth. Bring to a boil. Reduce heat, cover, and simmer for 20 minutes. Puree the soup with an immersion blender or transfer the soup to a blender (in batches) and puree. Return to pot. Stir in basil, salt and pepper to taste.